Thank you to all of our farmer-members who attended their Annual District Grain Committee Meetings in January. Election results for each district can be found at www.gfo.ca. In the December 2017 United States Department of Agriculture (USDA) report, U.S. corn ending stocks were pegged at 2.437 billion bushels, which was below trade estimates. 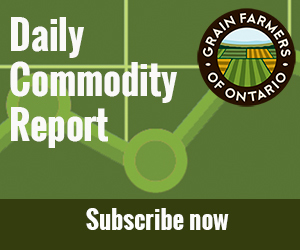 Demand for corn for ethanol increased 50 million bushels from the November estimate. On the soybean side of the ledger, USDA increased soybean-ending stocks to 445 million bushels, but reduced exports by 25 million bushels from their November report.